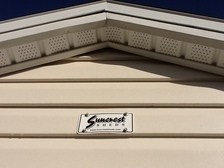 Suncrest Sheds manufactures Florida's premier, portable garden storage building. From children's play houses to a 12 x 30 garage, the only limit to our building is your imagination. We use only the finest material. From premium grade southern yellow pine framed completely at 16in. on center, to our 3/4 in. pressure treated plywood floor which can easily support cars, boats and motorcycles. standard walls are constructed with R11 insulation and premium vinyl siding (your choice of color) with a 20yr warranty. No need for painting, just hose it off. Your roof comes with standard 1/2in. plywood and premium grade shingles (you choose the color). You choose if you would like a beautiful eave or not. We can also install a standing seam metal roof or permatile to match your house! Your options are limitless! Whether you need a pool cabana, studio office with a bathroom, toy garage, "man cave", tack room for the horses, dog house/kennel or even just a place to park the lawn mower......we are sheds unlimited!